When I was in third grade, I tried out for the elementary school choir. Broken-hearted over not being accepted into it, I cried for days. Finally, unable to stand my sorrow any longer, my parents called someone. I do not know who spoke to whom, or was said, but the upshot was that I was allowed to join the choir. I was glad. I loved singing. However, the damage had been done. Knowing that my inclusion was due to my parents’ pulling of strings, I have felt uneasy ever since as regards my singing voice. I still love to sing and have continued at times to do so--rounds at summer camp, simple chants and songs at Women’s Events, the alto line of hymns on Sunday mornings. Nevertheless, when it comes to singing, I have felt ashamed. I have felt like a fake, a phony, a fraud. And so it came as rather a surprise a few weeks ago when I let a friend talk me into taking a voice lesson. The voice teacher, also a friend, began by asking about my singing experiences. Tears sprang up as I admitted the deep shame and profound sadness I have carried for sixty years. Unfazed, she invited me to sing with her. We sighed breathy ahh sounds and sang a few scales to warm up. We sang “O God Our Help in Ages Past.” We sang “Amazing Grace.” We sang “What Wondrous Love Is This.” She told me some things that were going on with my voice, and she gave me some pointers about making certain sounds differently. She said to sing every day. Every day. Most amazingly, she told me that if I were trying out for the local women’s chorus she directs, I’d be in! Though I know her to be a candid person, I still find it hard to believe what she said. Nevertheless, wanting to believe – in fact, trying to believe – I have been singing every day. And then one day last week, I found myself decked out in a blue choir robe singing the Maundy Thursday service with a local church choir. Had something Easter-ish happened? I don’t know exactly resurrection means, at least not with any certainly, though the word is one we hear and speak of often during the Easter season. After the exceptionally cold and hard late winter we had here in Virginia, perhaps the bright yellow daffodils and the silvery calls of spring peepers are inklings of what resurrection looks like, what it sounds like. And after six decades of feeling ashamed of my voice, perhaps being able to join with a church choir to sings Mozart’s “Ave Verum” last Thursday evening was a hint of what resurrection might feel like. What about you in your world? What are your inklings of resurrection? What calls you this Easter season to hope, to healing, to renewed life? I'm so glad you've found your voice and that it's been affirmed. 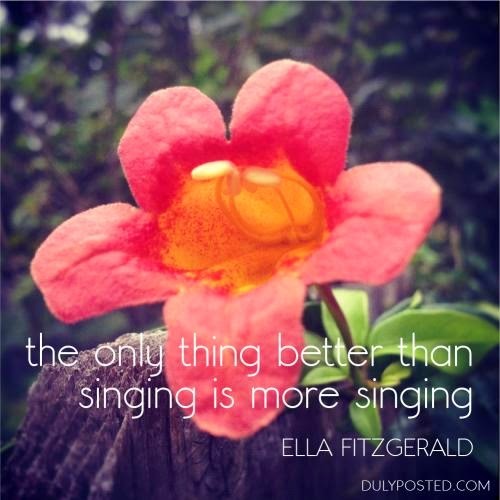 Singing is one of the joys of my life and I pray it may be one of yours. Keep singing!